The DEI Showroom and Retail Store was opened for the fans in June of 1999. If you're in North Carolina for NASCAR racing and you're looking for something to do in between events at Lowe's Motor Speedway, Dale Earnhardt and Richard Childress have an offer for you: Stop on by their shops for a visit. Full Story. 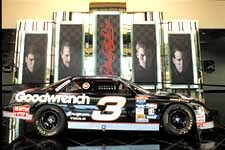 Dale Earnhardt Inc. announced the opening of its spacious 8,700 square foot Showroom and Retail Store to the public today. Designs for this state-of-the-art facility were first implemented over 3 years ago and the long wait by fans should prove to be well worth it. Full Story, including directions.